But I think this is something I can get behind and stick to. 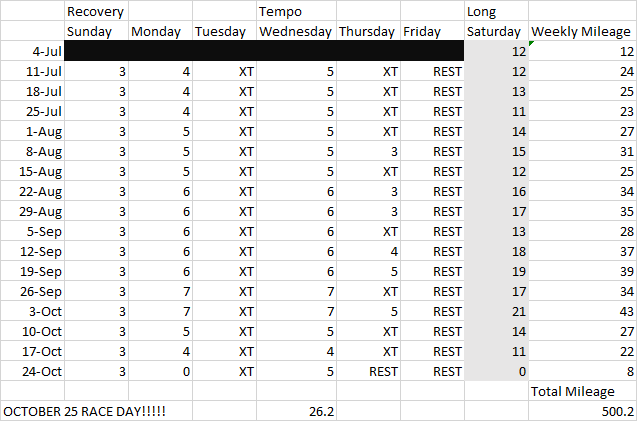 A 500 mile plan (including the race) that gets me to where I need to be distance and fitness wise, preserves my crosstraining time, and gets me some rest. And Sunday could also include bike or gym, since it’s a nice easy three mile run day. It’s a very simple plan. No special hill work, no real speed work other than tempo runs. Just about logging miles and getting ready to finish a marathon. So I’m going to be marathon training in the brutal ECC summer. Pray for my soul. And my legs. And my electrolyte balance. That looks like a very do-able training plan. The heat, on the other hand, is not so great. Can you run in the morning? Which marathon are you training for? I am super excited about you doing a marathon!